My book club is reading A Town Like Alice by Nevil Shute this time around. I have read the last two books after the fact because I didn't receive them through our inter-library loan in time. So, determined to be prepared at the next book club meeting, I ordered this one for $2.99 from Kindle. Presto. I can begin reading immediately. Actually, that's about the only thing I like about the Kindle. I really do prefer "real" books, especially since I always seem to be flipping back to refresh my memory on a name or some other detail. I just haven't figured out how to flip back and forth on a Kindle. Wait. That might be one thing in favor of the Kindle, because sometimes, I can barely stand the suspense, and I have to look at the ending. I was sorely tempted to in this book because I started imagining all kinds of bad-ending scenarios, and couldn't read it fast enough. Every once in a while, skipping to the end does spoil a book for me, but most of the time, I am then able to relax and enjoy the ride. I know it's probably simple enough, but I didn't feel like trying to figure out the "Go to" command. And I'm glad anyway that I didn't allow myself the option. The ending was worth waiting for. By the way, I don't do this with bona fide mysteries, because the suspense is the point, isn't it? I loved this book. It's an old one (1950); a movie has been made about it, which I haven't seen. It's about a young English woman who survives a literal death march through Malaya during World War II (based on a true story) to go on to live in Australia after the war. It has history and romance and adventure. I read it over the weekend, stopping only to do necessary chores and errands, and go to church. I barely stopped to enjoy this delicious carrot cake. Carrot cake, you say? Finally, she's getting to the point. This carrot cake has pineapple and coconut in it, a departure from our usual recipe. It is delicious, and even better the second day, when the flavors are truly melded. So it's a great cake to make ahead of time if you have people over, or need to take something to an event. The recipe is here. We didn't put raisins in it, because I don't really care for them. And it was baked in a 9 x 13 pan for 50 minutes (the recipe calls for an 8 x 12 pan, which I don't have). 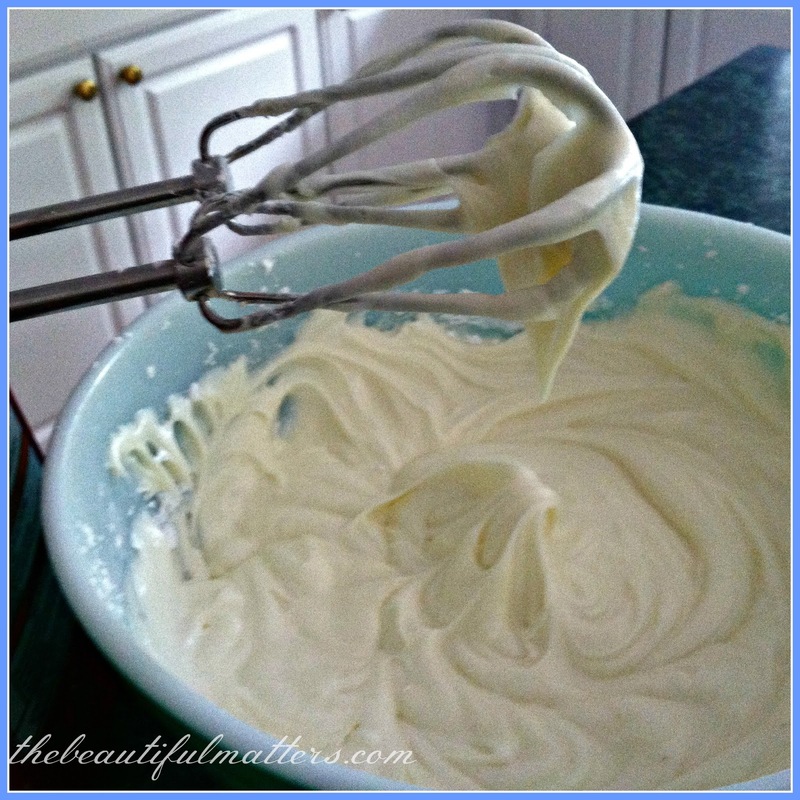 The frosting recipe is here. 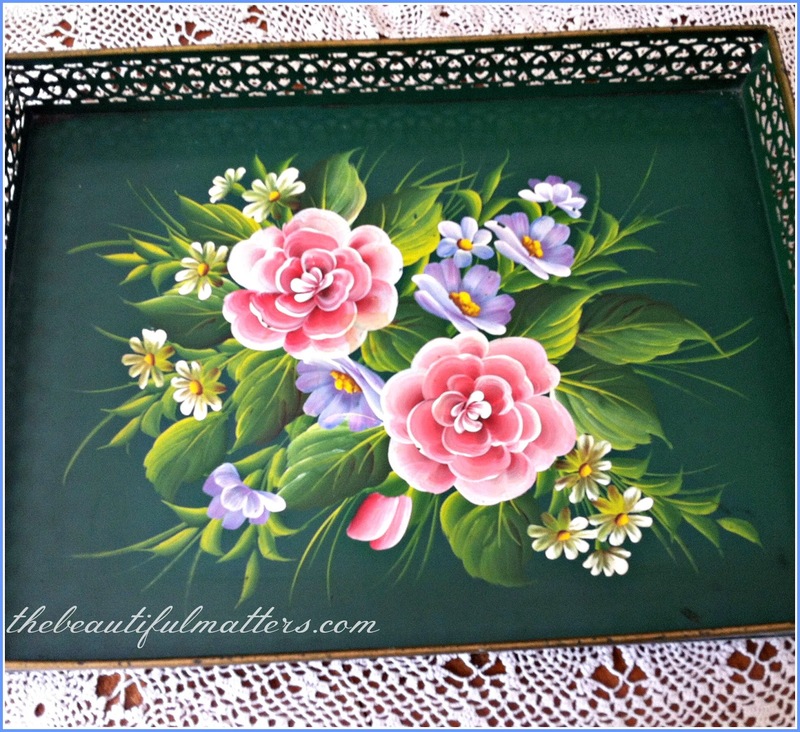 This is the tray I used for my little tea-and-cake time . . .
A lovely colclough teacup . . . 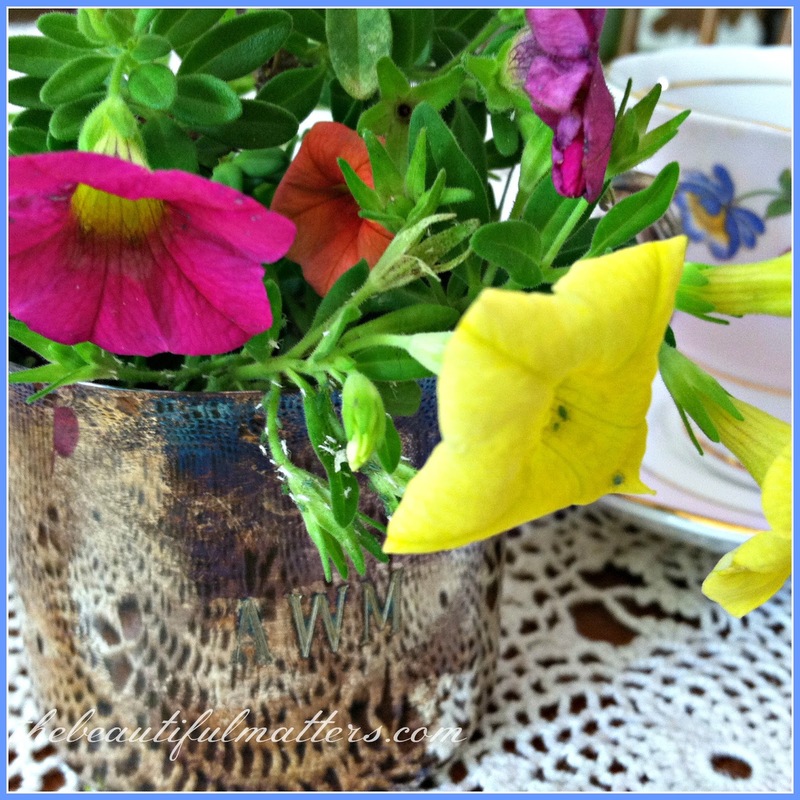 The flowers are in our youngest son's silver baby cup. Nothing like a homemade dessert, a cuppa, and a good book. Life is good. Deborah, Your cake looks marvelous. I'm bookmarking your post so I can print the recipes later. By the way, the cake looks just like I like it: with very, very thick icing!!! Mmmmm. Great with tea. We always have our son and family over for Sunday lunch; I think this would be a good dessert to make and share! Oh what a perfectly lovely post, Deborah! Oh my word, you're killing me with the carrot cake. It looks delicious. My husband and I were in Texas last week and had the most scrumptious piece of carrot cake for a late-night dessert. Now I am craving it all over again. Regarding your book, I, too, have read the ending before for the very reason you stated - so I could then relax and enjoy the story! We part ways on the tea, though. I am a coffee girl. Happy Labour Day, Deborah! Yours sounds like a good book. I am reading a book right now that a friend loaned me written by Tamera Alexander. I can hardly put it down. Your carrot cake looks amazing and very moist. 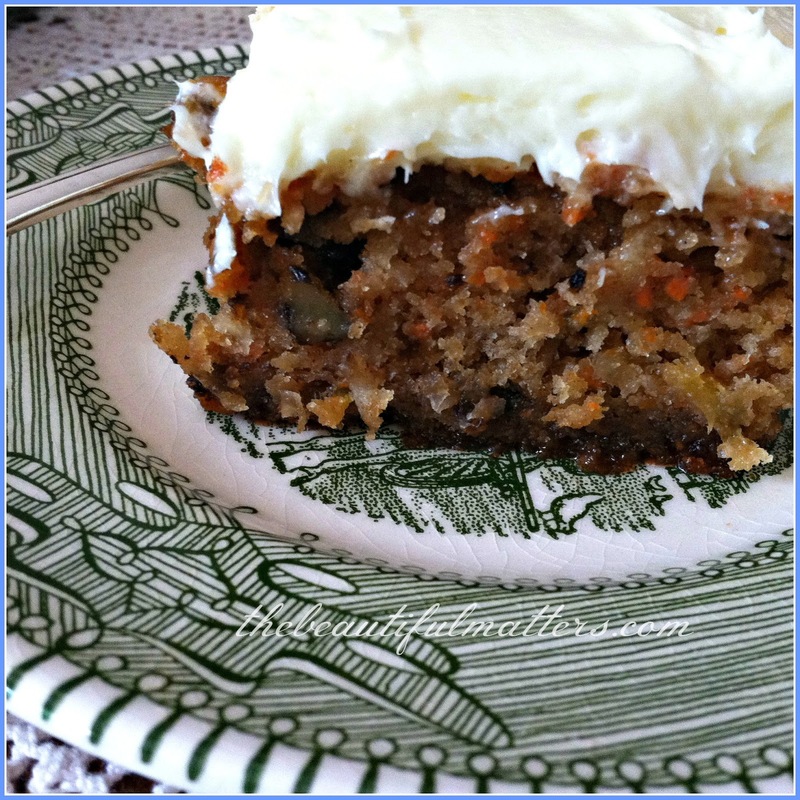 I love pineapple in carrot cake because it makes it so very moist. Your Colclough teacup is a pretty one too. Thank you for sharing your lovely post with me at Tea Time Tuesday and enjoy this new week. Deborah, you had me at the post title! And you knew exactly what a reader like me would be thinking, "alright, already, where's the carrot cake?!" Pinning. Winning. Thank you, and Happy Labor Day to you! What a beautiful setting, Deborah! A pretty teacup to sip from while reading your book. I have a Canadian Kobo and love it, although sometimes books are not available for it - but always for Kindle. Oh my goodness, sweet pea! Wish I could go to your place for a piece of cake and tea in the gorgeous teacup...of course, with your beautiful company. ....and I just pined this! 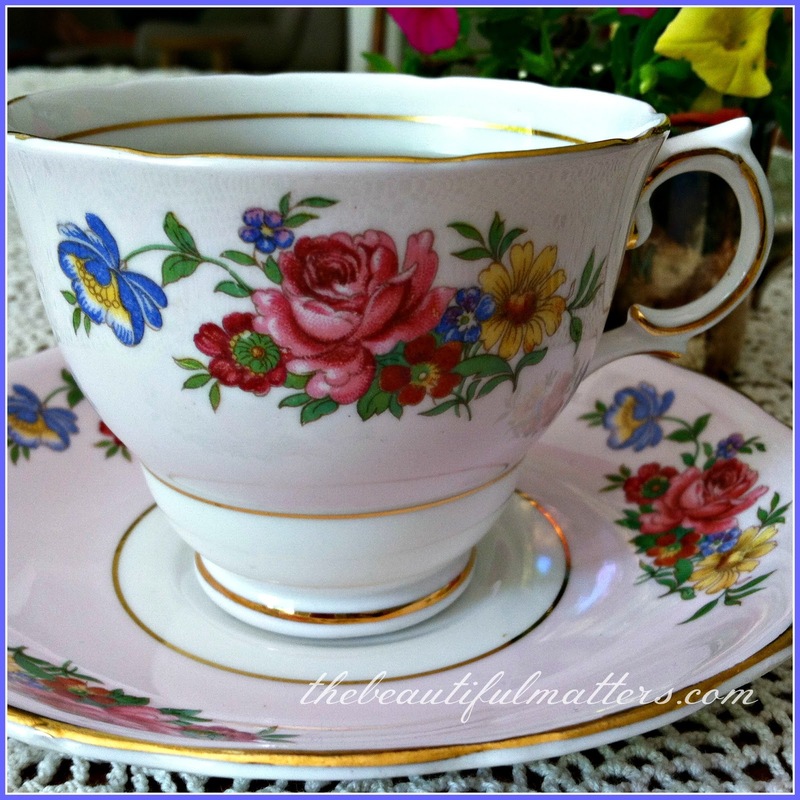 I have the same teacup..one of my favorites! Your carrot cake looks scrumptious! Glad you enjoyed A Town Like Alice. I read it at school, but actually it is much better after one has a lot more life experience. Alice Springs is not much like the one in the book any more. Your cake looks so good and the tea cup is so pretty. The book sounds realty good and thanks for the recommendation! Have a wonderful week Deborah! The book sounds interesting, Deborah. I'm like you in reading the Kindle, as sometimes I like to flip back. I do, however, enjoy reading books from it and ordering is the best!! 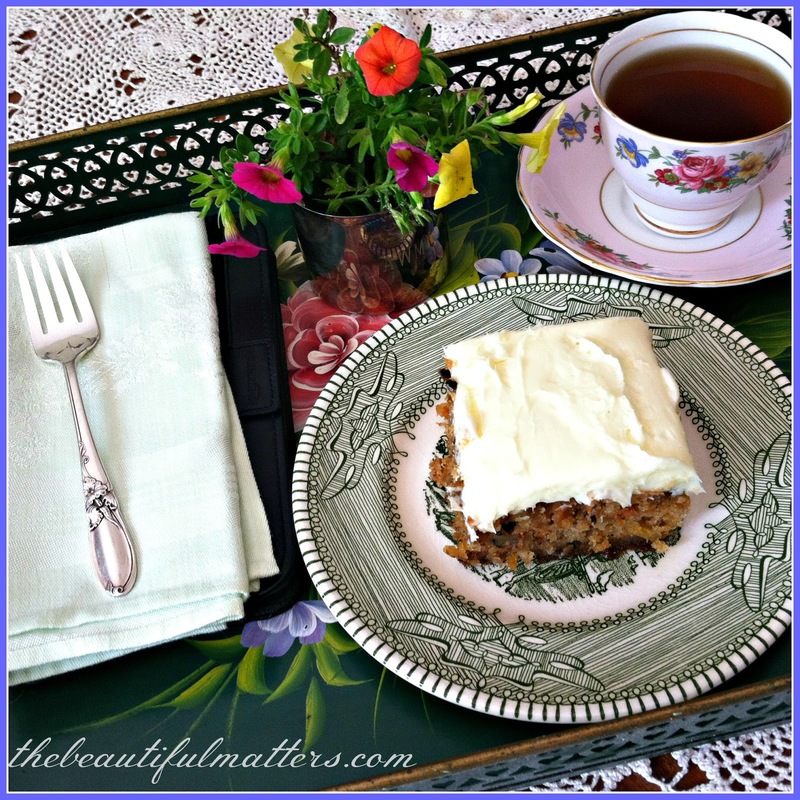 Now about that carrot cake...oh my goodness, does it ever look wonderful and so pretty on your tray with your lovely teacup. I'm swooning!! Indeed, a cuppa and a good book makes life such a bliss! Hugs and happy September to you. I really enjoyed the book and the film was a real tear jerker. The cake and setting was a real delight. Good Morning, Beautiful photos! The cake sounds so delicious and moist. The book sounds good. I am beginning to collect books for winter reading. Have a happy day. That Carrot Cake looks scrumptious and I bet it is. I seem to remember watching A Town Like Alice many years ago. I think it was a tv mini series.... Can't remember for sure. What a lovely post! I love carrot cake and yours looks delicious. Beautiful colclough teacup. Love your tray and teascape. 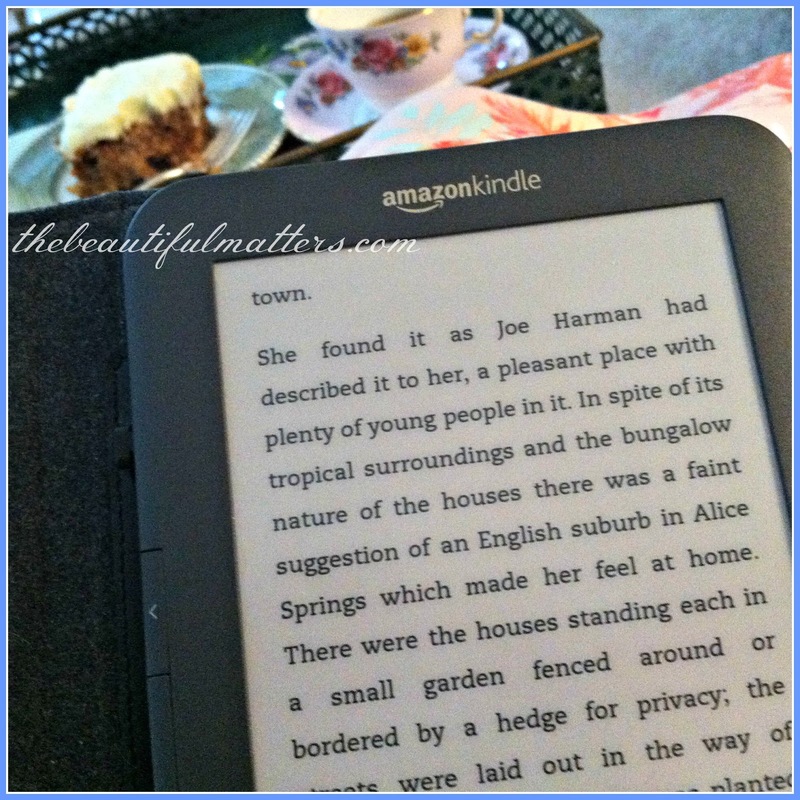 This may be the perfect post: tea, cake and a good book recommendation! Happy Tea Day! Oh that carrot cake looks divine! Nothing like a good book and delicious cake to go with it! I agree Deborah, A Town like Alice is a poignant story, I think like you, I need to visit it again. Hi Deborah, What a treat you created with the carrot cake and it looks so delicious. Love your tea cup and the tray is gorgeous. The flowers in your youngest son's cup is so pretty. I have a Kindle too, it's nice, but I still prefer to hold a real book. In this case it served a great service for you. Now I have a book to look for! I visited friends in Australia some years ago, at exactly this time of year, and I've been thinking a lot about that today. So this was very timely! Mmmm, tea and cake! I love reading on my nook and a cup of tea is always a nice addition. Pretty photos, too. Happy Sept! I prefer real books too but do enjoy my Nook, a gift from my youngest son & his wife. I love being able to shop for books to read and then download the ones I want right then & there. The carrot cake looks so yummy and the different ingredients sound like they will make the cake more to my liking, minus raisins for me too, don't care for them in baked goods. It is getting close to the time of year I love to bake, so will keep this recipe in mind ! I remember someone telling me about this book years (as in about 20) ago. It sounded good. Now, I want to check it out and read it myself. I will also suggest this to my sister for her book club title. They are always looking for something. I'm a legendary carrot hater. Ironically, I'm also a legendary carrot CAKE lover. Odd, isn't it? Beautiful teacup and wonderful looking cake! I will have to try the recipe! My kindle just recently quit working, so I bought a Samsung note this time. I prefer to read from real books, too. Although it was fun browsing through the titles that are available. Have a good rest of the week! I am trying to find the right place for replying to a comment you made about A Town Like Alice. This will have to do. There are two versions of the film. I have not seen the Brian Brown version at all. He is probably very like the real character that Neville Shute Norway imagined. It is not a style that come across well in cinema. Reserved. Stoic. Courageous. Silent-type. I may have watched the older version with Peter Finch. Maybe. Peter Finch was the same physical type. Many men from the bush were like that. Times have changed. You can see both film versions on Youtube. When I was growing up I lived in a town where there were many families with fathers and husbands who had been Japanese prisoners of war. World War II. The horrors they had survived were never spoken about. This was the official advice given to all. The things were so ghastly that every effort was to be made to help these men and women bury those memories very deeply where they would never come back. My father was one such man. Twenty years later my father told me about being tortured, watching his friends being beheaded, and seeing men crucified. People starved to death. I remember my Dad saying that he was so hungry he ate maggots and cockroaches. That was the reality. So when the film of A Town Like Alice appeared it cut too close to the bone for so many people. What does "too close to the bone" mean? Imagine if you are cutting a roast and you go to the bone. Deep. Imagine being accidentally cut this way yourself. The shock, the scare, everything is horrible. It takes a long time to heal. A surface cut is easier to tolerate. So this film was a cut too close to the bone for the men and women who survived the Japanese camps. They could not be in the same room. Other people read the book and watched the film. But if it was your family, your friend's family, you kept quiet. Perhaps you have read The Railway Man or have seen that film. It came out last year. King Rat was popular at one time. There would be other books. Probably your parents knew soldiers or nurses who had similar experiences to those of the characters in A Town Like Alice. Louise, thank you for answering my question, and helping me to understand this a little better. I'm sure my book club will appreciate this information. So horrific for your father and the others who experienced those cruelties. And they're still going on, now in a different part of the world. God help us. And it must have been further torture to not have been able to talk about it, esp. with others who had been there. My daughter, who is a psychologist, says one of the first therapeutic (healing) steps is "universality," the idea that I'm not alone, not the only one. We learned that lesson here, I hope, after Vietnam, and the shameful way we treated our returning soldiers. My email is found by clicking on the "Contact Me" button in the upper right hand corner of this page, and also under the "About Me" tab at the top. But commenting here was fine; perhaps other readers would be interested. I will check out both the movie and the book you recommended. Thank you, Louise, for your thoughtful comment. 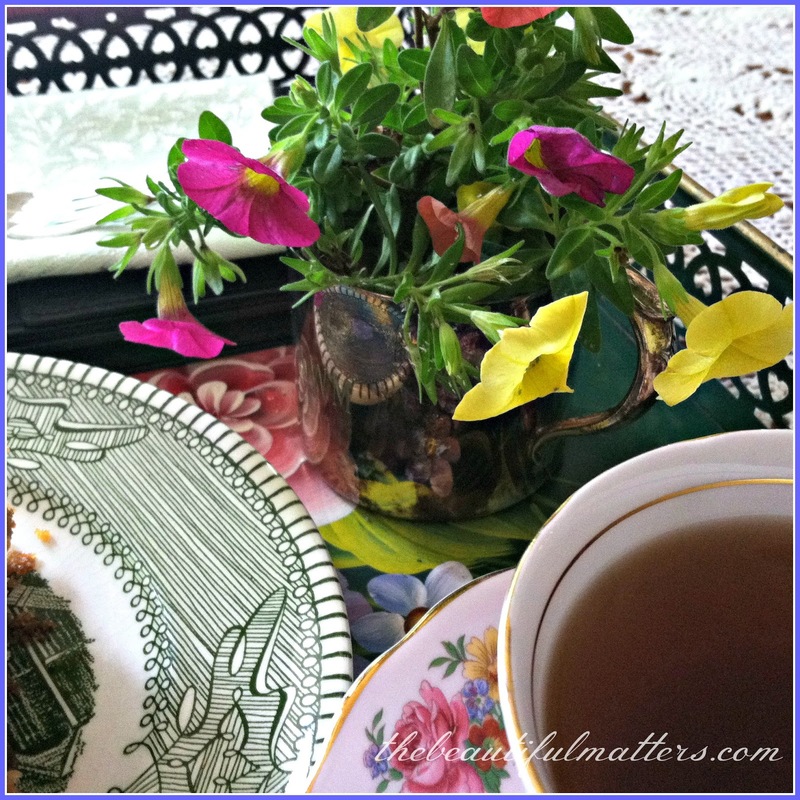 Deborah, I love your pretty tea vignette. I belong to a book club, too, and I will have o remember this book as a suggestion. We are a bit late reading it, but we read UNBROKEN by Ellen Hildenrand, and it was amazing. It is one of the best books I have ever read and so very moving, though violent. I think we owe it to all of our WWIi vets to read it. Dropping by from Beverly's party to wish you a Happy Pink Saturday! From one Deborah to another Deborah.........LOL! Your setting is so pretty, and that carrot cake is something I would enjoy right now with my coffee.. I have learned to love my Kindle. Like you, I really enjoyed books, but I accumulated and unmanageable quantity over the years, and now I am enjoying not having to find a place for more books. I will check into this book for my Kindle. Like Sheila, I recommend Unbroken. I had to put it down frequently in order to digest the horror of the reality, but it was amazing, and I highly recommend it. Have not read the book, but loved the series shown on PBS. It's one of those stories that has remained with me for thirty years. As for the recent question about commenting...I allow others to make their own choices. It does not affect how I decide to do things. I have always been amazed by those who email a response in addition to leaving a comment in a blog. That equals a two for one response in my book. I'd have given up blogging much longer ago if I had ever tried keeping up with that grueling pace. Not reading anything at the moment. I do my reading mostly in the wintertime when I don't venture out. Beautiful cake -- looks like that recipe is a keeper! You said, "Every once in a while, skipping to the end does spoil a book for me, but most of the time, I am then able to relax and enjoy the ride." I've done that SO many times! Actually, it doesn't always spoil the novel for me. Sometimes the angst and suspense of wondering if the hero/heroine (or who ever) is going to be OKAY, is distracting me SO much, that I can't enjoy the read. Skipping to the end, just to read a tiny bit to assure me that everything's going to be okay, relaxes me enough that I can then enjoy the book much better. Does that make sense? This sounds like a fascinating story. Wish they had the movie on Netflix streaming! Love your china and cake! Wish I'd been able to join you. I love kindle, but occasionally wish I could go to the end or go back and re read something which is hard! 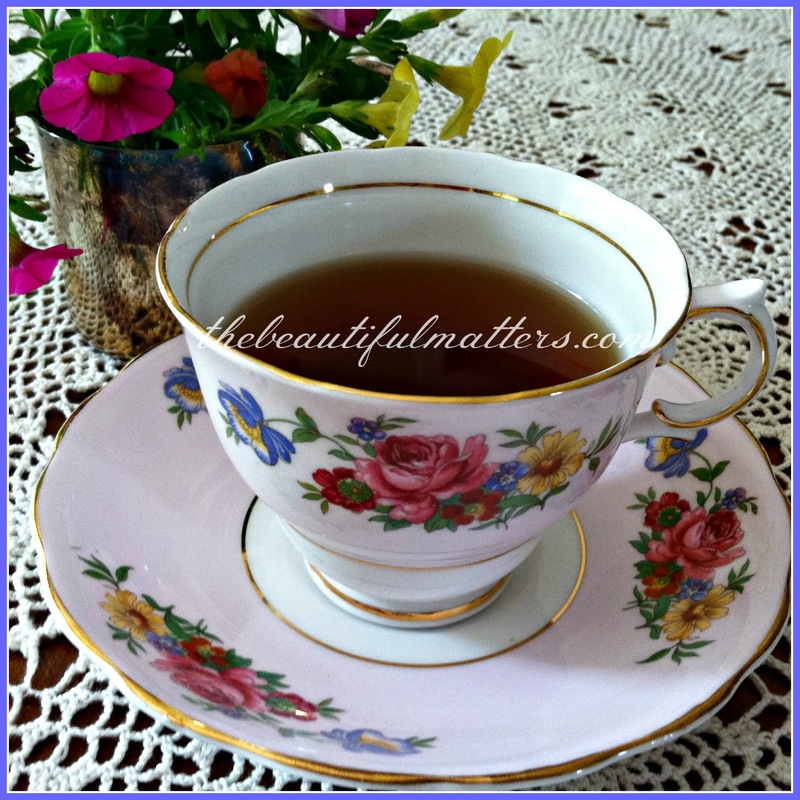 Thanks for linking to Tuesdat Cuppa Tea!